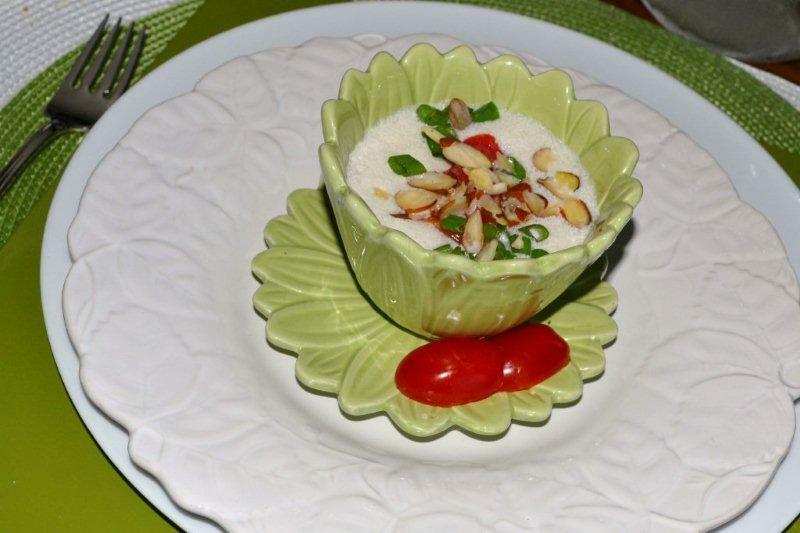 Chilled White Gazpacho soup is made with cucumbers, chicken broth, sour cream, white vinegar, and garlic, blended together and served with diced cherry tomatoes, sliced almonds and green onions. Delicious on a hot day and served with Basil Cracked Pepper Scones. 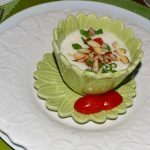 A make ahead light soup for garden club and spring or summer luncheons. This soup is served chilled and the can be made ahead. Easy to make and take, but keep refrigerated. In a blender, whirl cucumbers with 1 cup chicken broth, pour into a large bowl. Garnish with chopped tomatoes, green onions, and chopped spinach or as desired.